To run a time-sensitive marketing campaign to align with the World Cup. Create a customized Sweepstakes on Facebook using Vionic’s Deal Maker Pro. How Did The GAME by Ronaldo Do It? The GAME by Ronaldo is the first global crowdsourced football competition directly aimed at 270 million footballers globally (according to FIFA). Players are ready to experience a truly revolutionary competition. The GAME allows Teams to challenge and be challenged by other participating Teams from all over the world. With the 2014 World Cup trending, The GAME by Ronaldo wanted to seize the opportunity to gain new fans and boost engagement on Facebook. 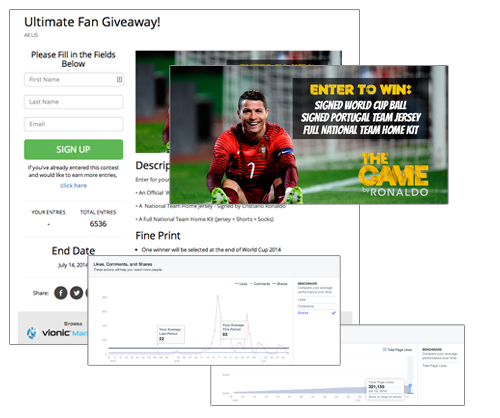 The GAME by Ronaldo created a Facebook Sweepstakes using Vionic’s Deal Maker Pro application. The campaign offered fans the opportunity to win a World Cup ball and National Team jersey, both signed by Cristiano Ronaldo himself, in addition to a full National Team Home Kit (jersey, shorts and socks).